Some edits made in 2014 with new info from a Dreamtime correspondent. A thread over at the Expecting Rain forums had me searching out the history of the photo to the left, one of a series taken in March 1965 by Daniel Kramer at a cabin located on Albert Grossman's Bearsville estate. The location is a storage shack on Peter Yarrow's mother's (Vera Yarrow) property in Woodstock, according to a conversation between Kramer and Bob Egan, of the fabulous PopSpots site. According to Kramer, most of the "weird ephemera" were books, magazines and family memorabilia from the Yarrow family -- including the photo of the man on the left. 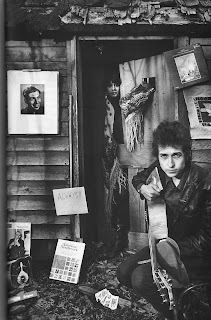 Bob Dylan is in the foreground with Sara Lowndes - soon to be Sara Dylan - standing in the doorway. This is one in a group of five or six shots taken by Kramer and intended (as Kramer relates in his 1967 book of photos, Bob Dylan) for the cover of Tarantula. Kramer and Dylan intentionally tried to replicate the look-and-feel of Kramer's iconic cover for Bringing It All Back Home, a little too successfully, as the photos were ultimately rejected as being too similar. As with the Bringing It All Back Home photo, Dylan is surrounded by a variety of weird ephemera, and as with the better-known photo, there's a tendency to read more into their significance than they probably deserve. Both Kramer and Sally Grossman have said in various interviews that most of the props used in the Bringing It All Back Home shoot happened to be at hand and Kramer used because he thought they fit. The same can probably be said of the props for the unused "Tarantula" photos. Unidentified box. The word "Religious" can be read at the upper right corner. Unidentified magazine. The magazine is the Sunday, March 14th, 1965 edition of the New York Times Magazine, and the person portrayed is indeed Senator Everett Dirksen, a politician probably best-remembered today for the phrase, "A billion here, a billion there, and pretty soon you're talking real money." (in fact, Dirksen probably didn't say that, but the quote is usually ascribed to him). Paper with Handwritten ALWAYS!!! A faint sketch of a face can be seen below the words. Unidentified record cover. Label is Verve. The cover is likely DVORAK: Slavonic Dances. JEAN MARTINON conducting the London Symphony Orchestra. RCA VICTROLA STEREO Record Album (VICS 1054). Unidentified record cover (not seen in all photos in the series): "The (unreadable) Jug Band." As also noted in the comments, The album is a 1962 compilation on the OJL label, titled "The Great Jug Bands." Needlepoint reading "Be True To Me. Let Me Be True to Myself." Dylan is holding a copy of The Bhavans Journal in his right hand, probably belonging to Sara, a magazine focused on Indian culture, life, and literature, established in 1954 and still being published. His cloth "sailor's cap" is in his left hand. The full series of photos can be found at Dylanstubs. 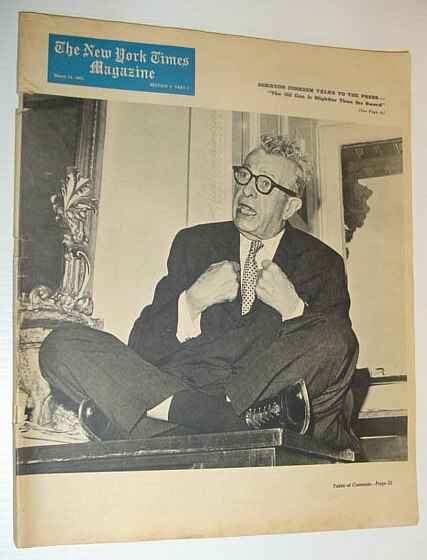 the man on the cover of the unidentified magazine appears to be the late Senator Everett Dirksen, Republican from Illinois. I believe he was Senate minority leader at that time and got a lot of media coverage as a voice of the conservative opposition to the Johnson administration. He had a strange speaking manner. Seemed an odd bird to me in my teenage years, but don't really have a clue as to any significance to Dylan using his image. Thanks a lot, that's interesting. I have once read (can't remember where) that the guy on the photo on the left is Hoagy Carmichael but I must admit that I'm not convinced. This paper with the handwritten "Always" could be a deliberate reference to Irving Berlin's famous song "Always": "I'll be loving you/Always/With a love that's true/Always" etc. The jug band album is The Great Jug Bands on the OJL label. The album on the lower left, as Mike says, might be Everett Dirksen. 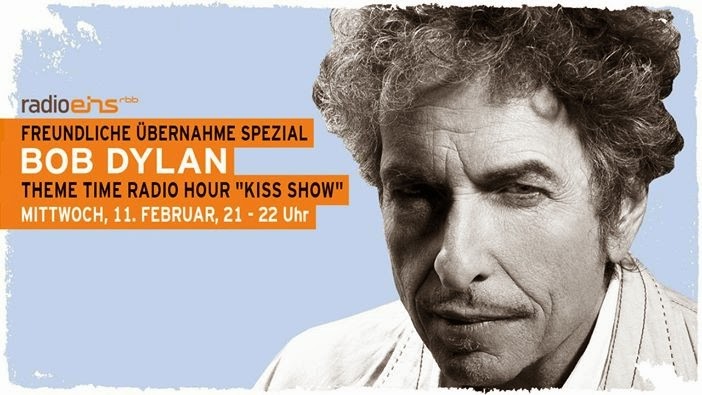 He recorded four albums (I have one and have seen one other and they are not this one but that still leaves two I've not seen) and even won a Grammy. Its very possible that Dylan was a fan of his florid speaking style. I don't think the picture on the upper left is Hoagy Carmichael. Some resemblance by Hoagy had a longer face.